Present your cards professionally in single or multiple pockets. From a simple business card holder to a multi-pocket wall system, our acrylic brochure holders are the ideal solution. Looking for a way to have more counter space and improved organization? 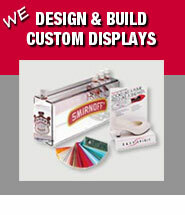 Brochure holders and literature displays can do the job. 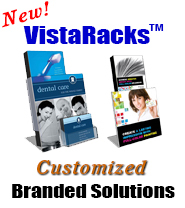 Attractive, portable and lightweight, they will also help you build more awareness and sell more products. We offer a complete line of high quality, easy-to-use, and affordable portable display products for trade shows, point of purchase, marketing, advertising, events, presentations and displays. Our products are designed with one thing in mind - to allow you to effectively and conveniently place your product or marketing message in front of your prospects and customers. Used in offices, reception areas, medical offices, law firms, state agencies, and school offices, these quality injection molded brochure holders are affordable, in stock and ready to ship!